Jimmy Song has weighed into the discussion surrounding the recent tweet that allegedly came from Bitcoin founder Satoshi Nakamoto. Like most in the crypto community, the Bitcoin Core developer doubted the authenticity of the tweet, and he pointed out how easy it would be to falsify Satoshi's signature. The tweet, which has since been deleted, originally emerged in the run-up to the contentious Bitcoin Cash (BCH) hardfork. It made references to there being "a bug in Bitcoin's code", and claimed that "there is only one way that Bitcoin survives", perhaps to lend support to one particular outcome of the BCH chain split and subsequent hash war. 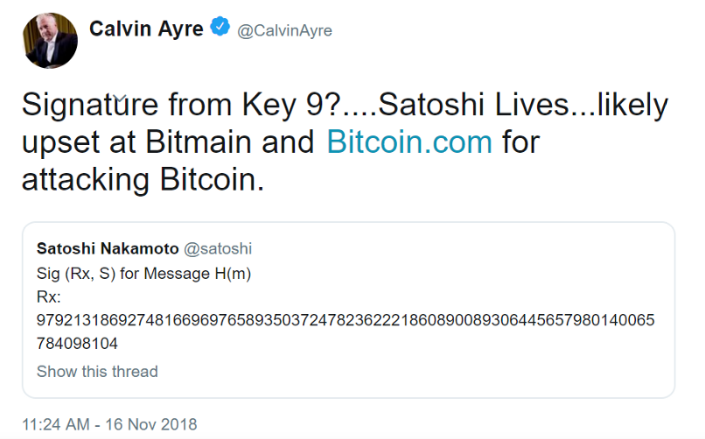 Bitcoin Cash SV (Satoshi's Vision) supporter Calvin Ayre was one of the more high-profile figures to share the tweet with some degree of credulity, although he clearly had his own agenda and may not have believed it to be genuine at all. Despite how implausible it all seemed, the presence of a digital 'signature', a code linked to Satoshi's genesis key for Bitcoin, seemed to go some way towards validating the post. Song's mostly technical article on Medium claims that while the signature may seem valid, the message it signs is nonsense and therefore the signature can't be real. A red flag was "the fact that this account didn’t use the standard sign/verify feature found in almost every Bitcoin wallet." He describes it as "equivalent to someone “running” a marathon in under 2 hours by starting close to the finish line...(the tweet) is equivalent to someone someone that’s “proving” that they ran a marathon in under 2 hours while allowing us to only observe them at the finish line". To prove that the signature is that of the real Satoshi, it needs "the digital equivalent of an observable race starting line". Song concludes that there is "a reason Faketoshi refused to use the normal sign/verify protocol built into many Bitcoin wallets. The reason was to try to deceive people with trickery."